This book written by Chitra Banerjee Divakaruni has to be one of the most interesting books I have read so far. The Mahabharata is one of the greatest Indian epics and every Indian child grows up hearing stories from it. I heard those stories too. But the big moment was when ‘Mahabharat’ was aired as a series on TV in the 80s. Every Sunday my sister and I would eagerly wait for it to be 9 AM and watch every episode with rapt attention. I am not sure how much the younger me actually understood but I made strong mental images and opinions about its many characters. I still remember the actors in the TV series although it was years ago, and while I was reading, I could actually see them as characters. For me, Draupadi will always be Rupa Ganguly (the actor). But now, back to the book. 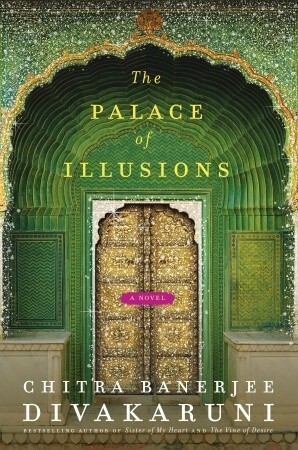 The Palace of Illusions is essentially the Mahabharata narrated by Draupadi. It traces her life right from her birth with her brother Dhristadyumna through the ceremonial fire, her childhood in her father, King Drupad’s palace, her svayamvar and her marriage to the legendary Pandava brothers and all the subsequent events that lead to the great war of Kurukshetra. I wouldn’t call it a feminist’s version, it is simply the story told from Draupadi’s perspective. Panchali a.k.a Draupadi or Krishnaa is an amazing woman, ahead of her time. She speaks about life with her five Pandava husbands, in the palace and in the wilderness when they are in hiding. Although she is secretly attracted to another man (this one is a shocker, but I’m not telling who) who is her husbands’ sworn enemy, she still makes a dutiful and strong wife supporting her husbands through bad times and good and together they go on to create the most beautiful palace full of optical illusions and build a thriving kingdom from nothing. Her friendship with Lord Krishna is very special to her. He is her friend, confidante and trusted advisor. In her moments of distress, she always thinks about Krishna. After she gets married, she has many power struggles with Kunti, her mother-in-law. Panchali realizes early on how dangerous and conniving a woman Kunti is, who has some skeletons in her closet. Duryodhana is really a generous and brave ruler who due to circumstances and under the bad influence of his uncle Shakuni goes on to become one of the greatest villains in Hindu mythology. The book makes you see these characters in a very different light, having shades of gray and not all black and white. Panchali is a fiery woman who redefines all the important characters in this great epic. And that is why it makes for such a refreshing read. Having said that, I feel the author has skimmed through certain important events which deserve more than a mere mention since they change the course of the story. There is no mention of the Bhagavad Gita in the book, which I thought was a little odd. But most importantly, the essence of the Mahabharata has been captured beautifully in the words of its most important and complex character, Panchali.